Autumn means sheep killing time. Time for those bouncy cute lambs from the spring to be rounded up, the best ones sorted out to be wool producers, or high class rams, and a good chunk of the rest turned into delicious roast legs of lamb. 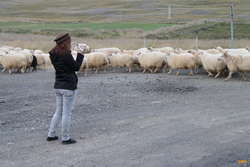 All over the country throughout September, in every valley, the annual round up occurs, or "Réttir" in Icelandic. 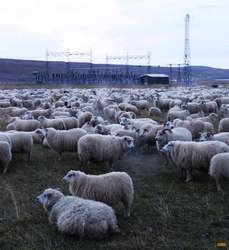 The sheep have been roaming free and wild around the highlands all summer, and some locals spend a week or so rounding them up, and driving them down to the local sorting pens. This is a big day in each community. Everyone comes together, on horses, on foot, on quad bikes and in jeeps, helping get all the sheep down into one paddock, and then spending all day checking ear tags and dragging sheep arouund into each farm's pens. All the generations are there, from young to old, meeting, greeting, chatting, gossipping and flirting. Kids riding sheep around, sheep dragging kids around. Old men in dirty overralls sharing opal shots and watching the grandkids. Girls in makeup and gumboots, wrestling sheep. Boys watching girls wrestle sheep. It's really quite a great day. I'd been to one two years ago, and had a great day, and Kata was hoping to film one, to take some footage back for the winter in Russia. Bjöggi and Ásta were up for a trip, so we loaded up the car and heaaded off for a road trip north. 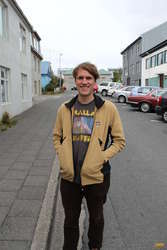 Destination, Miðfjörður. Our timing enroute was stellar, and we ran into the Hrútafjörður roundup just as they were coming down the last valley down to the pens. They would be sorting the next morning. 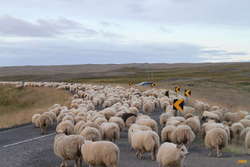 The sheep quite enjoyed having the old highway to walk along, and it sure made for some fun pictures. After dinner though, we had to get to Miðfjörður and get some tents up. We were planning on camping by the round up men, and following them down with cameras the next morning. 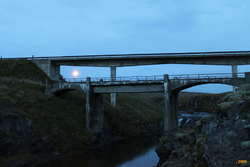 We'd heard the plan in Miðfjörður was to walk them down the last few km the next morning, with sorting in the afternoon, so we drove down the valley and set up camp by the river, and had a lovely evening gossiping and sitting on the hillside. Perfectly fantastic weather for camping, especially in September, not a breath of wind, and light scattered clouds dappling the moonlight.